Summer camp and my camp counsellors have made me who I am today. The summers that I spent in the forest and near a lake, thanks to the leadership of my counsellors, allowed me to experience some of the most influential and defining moments of my life. Not everybody can be a camp counsellor. It takes a special kind of leadership. When I was fifteen, I went on my first canoe trip in Algonquin Park, Ontario. The only other people on that trip were six other guys and two counsellors. We spent hot days paddling the swampiest, buggiest rivers and rainy days portaging the wettest, muddiest trails. At first it sucked. On the third day into our seven day trip, I had had enough. We were portaging up a giant hill, and halfway up, I threw the canoe I was carrying down to the ground and sat down in the mud. My camp counsellor, who was further up the trail, came back to me, and asked me what was wrong. I told him that I couldn’t carry the canoe anymore, to which he said, “Ok, but the nine of us, together, can find a way to do it.” And sure enough, I and three others who had already finished the portage took turns carrying that canoe to the other end, and we continued our trip from there. It was this simple lesson in teamwork and group problem solving that inspired me to be a camp counsellor and canoe trip leader years later. Over the course of six summers, I guided over twenty separate canoe trips involving almost one hundred and fifty young men and women. It is often a thankless job. 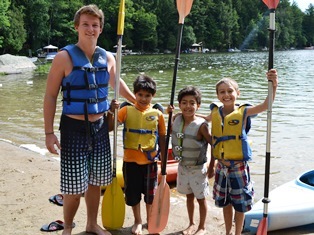 As camp counsellors and trip leaders, we are entrusted with the safety of people’s most precious assets, their children. In addition to dealing with the everyday issues of having children away from home: bed-wetting, bullying, homesickness, cuts and scrapes, or the challenges of growing up into young adulthood: relationships, self-confidence, identity and self-esteem, camp counsellors are expected to inspire confidence, resolve conflicts, care about the environment and be effective leaders, not just to the campers, but to their peers. Camp counsellors work longer hours than any other ‘average’ job, and get paid less to do it. As a camp counsellor at an overnight camp or perhaps on a canoe trip, one does not work nine to five, Monday to Friday. In fact, it is more equivalent to the hours of being a full time parent. Camp counsellors are on call twenty-four hours a day to deal with any issues that may arise at night, and still have to wake up the next morning with a smile on their face. It is the equivalent to having a job where the requirements are working all day, every day, but only being paid for forty hours a week at minimum wage. I still chose to be a camp counsellor. I did so because the personal satisfaction that I had was far greater than any monetary compensation I received. The skills that I have learned from camp, both as a camper from my counsellors and as a camp counsellor myself have influenced the way I am and the way I view the world. This experience has taught me not just that there is value in leading, teaching and inspiring others, but to do so without reward is the true meaning of leadership and service. The counsellor on my first canoe trip could have just as easily taken that canoe I was carrying and brought it to the other end of the portage himself. He was more than capable. He could have also just as easily told me that I was “useless,” “weak” or “not part of the team” for not being able to take the canoe. But instead, he chose to allow me and the others on that trip to find a cooperative solution to our challenge. There have been several times in my life when my non-camp friends and colleagues questioned why I would spend the summer at camp, when there are so many “better” jobs available for young people. However, none of these “better” jobs give the opportunities for broad professional development, nor do they give a sense of value and pride in work that camp does. Being a camp counsellor has brought out the best in me and has taught me how to deal with the worst in others, and while this is my experience at camp, my non-camp acquaintances don’t seem to understand this. Maybe, at the end of the day, they never will. But I think as camp people, we all have a responsibility to share our camp experiences, if anything, to encourage the types of positive thinking and learning that camp has taught us.